The first year of marriage is full of ups and downs; there really is no other year like it for a married couple. Finances are tight, schedules are tweaked, household chores are fluid, and you're just trying to find the everyday groove with your spouse. So when the holidays come around, it is even more important to celebrate that year and for the future ahead. 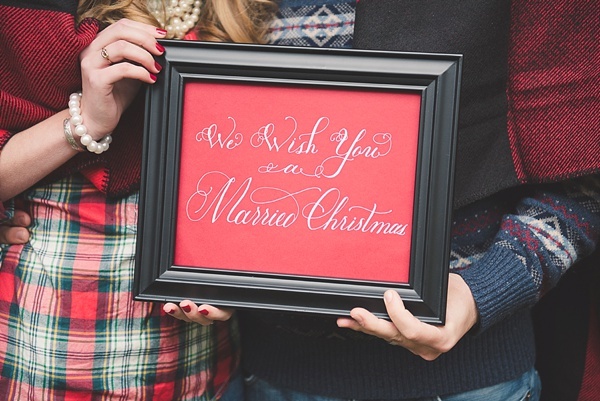 Hosting your first holiday or Christmas together shouldn't be a time of frustration or unrealistic nesting perfection. 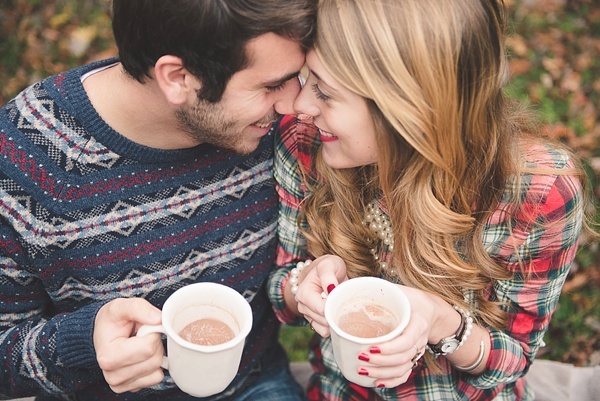 And even though you two might have a small budget, it doesn't mean you can't have a beautiful winter season together! 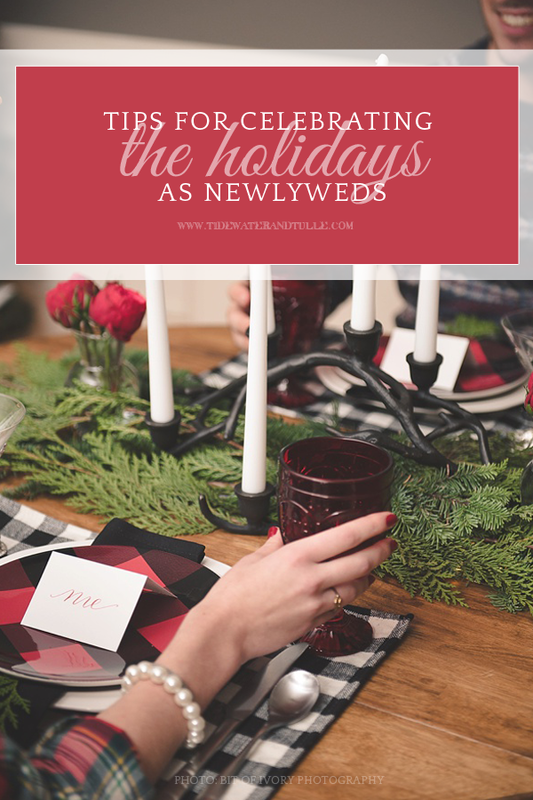 In partnership with Pottery Barn, we are showing that no matter what holiday you celebrate as newlyweds, there are lovely ways to celebrate in cozy, stylish, and affordable merriment that will set the foundation for holidays to come. 1. Marry the past with the present. 2. Make your own new traditions. Did you grow up with buying ornaments each year? Do you make a certain kind of cookie at the beginning of December with friends? The first year of marriage is a testing ground for blending what two people have done individually in the past and what those two people will soon create for the future. It's not easy. It's a transition for everyone! My husband and I were married at Christmastime, so we knew that was already a tradition in of itself, but we actually celebrate Christmas in a new city each year. It's a tradition I've come to look forward to and cherish every December. Whether it's a train trip across the country to ring in the new year or a festive tray filled with hot cocoa and treats to enjoy at your backyard's picnic table, find something that is just for the two of you. 3. Remember the little details. 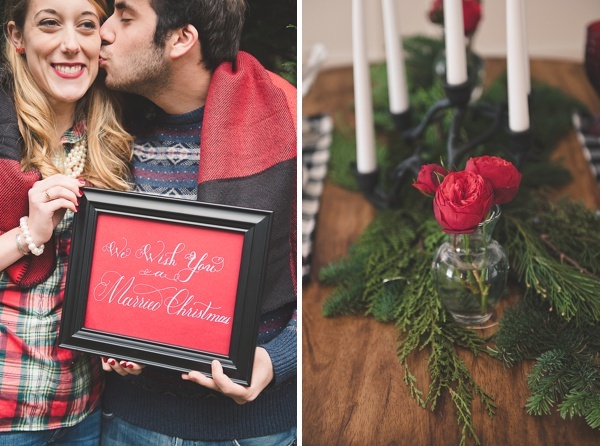 You don't have to be lavish to have a beautiful Christmas date with your beloved! 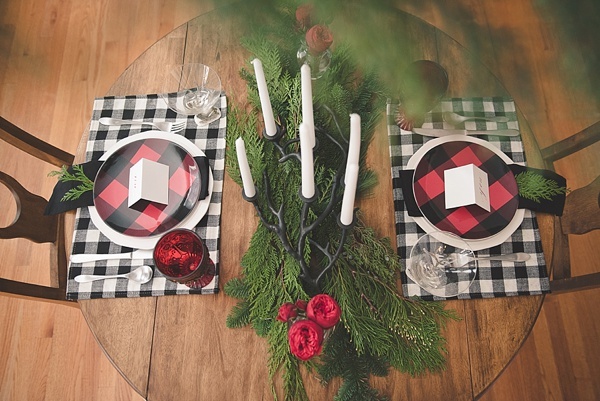 Greenery and holiday red blooms make a table go from simple to simply chic. 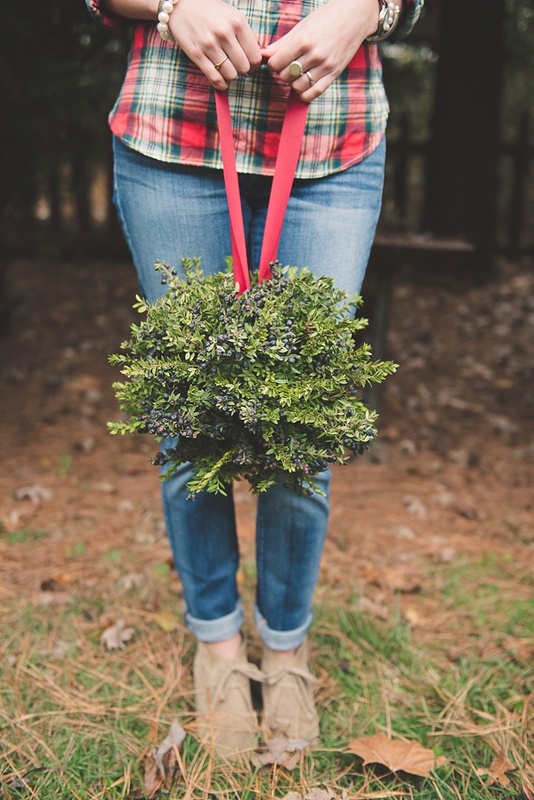 Typically, you can find pine, spruce, fir, and other Christmas tree-like branches anywhere plants are sold or grown. But if you're not the DIY person like me, garlands and a few bud vases can be less than $50 from your local florist. Get some fab drinking glasses (like the stag martini ones we found at PB!) and mix your own holiday cocktail. 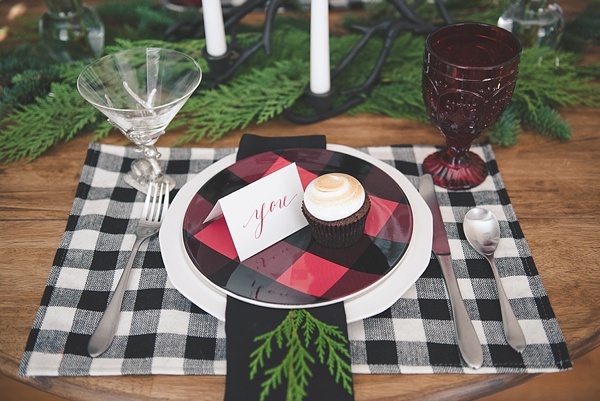 And if you have a sweet tooth, pick up a few sweet treats at your local bakery to decorate the plates. 4. Stick to your budget and personalize. It's easy to get carried away with all of the pretty things we see in stores, but we believe in being fiscally conscious, especially that first year of marriage! 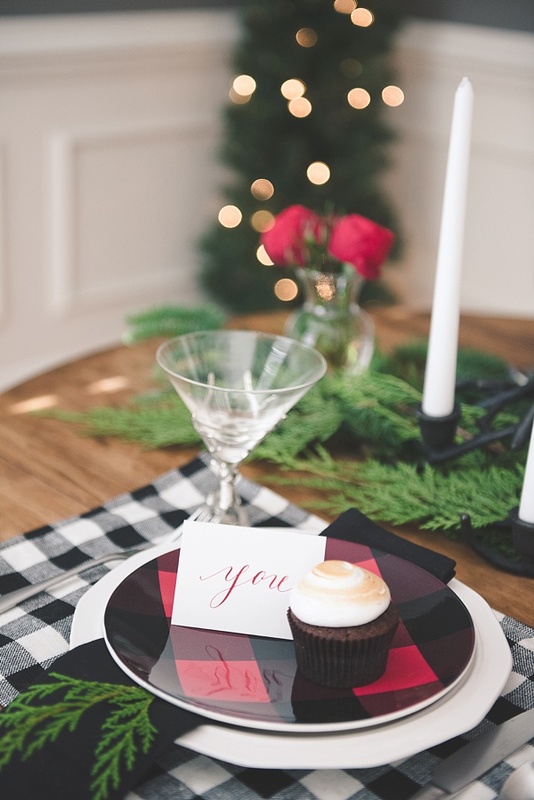 The more you personalize your holiday, the fewer frivolous purchases you make... which means putting your budget more towards quality entertaining pieces that you'll use for decades to come as well as the handmade! Handwritten place cards and signs are a beautiful way to transform old scrapbook paper into unforgettable sentimental moments. 5. Consider renting furniture or space. Now get under that mistletoe (or Victorian kissing ball! ), give each other a smooch, plan an intimate dinner-at-home for two, and cheer for one year of memories with many more ahead! 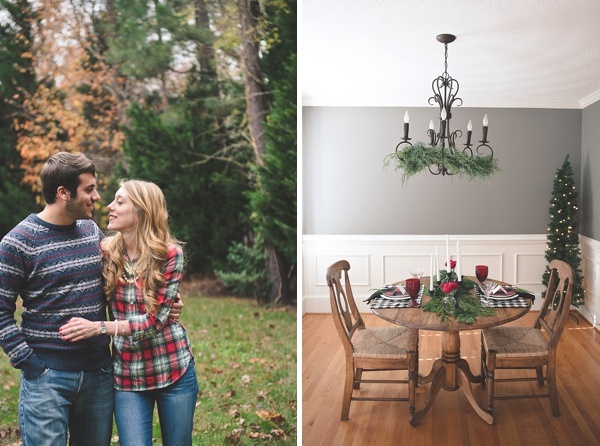 Many thanks to Pottery Barn for partnering with Tidewater and Tulle for this newlyweds-inspired post! And while the disclaimer is that I was sponsored through compensation to write this, these words and my loyal love for the brand are all my own. Some of the above links are also affiliate-connected and purchasing through these links helps support future blog projects. You can find our full affiliate disclosure policy here on Tidewater and Tulle. Looking for the Pottery Barn goods?